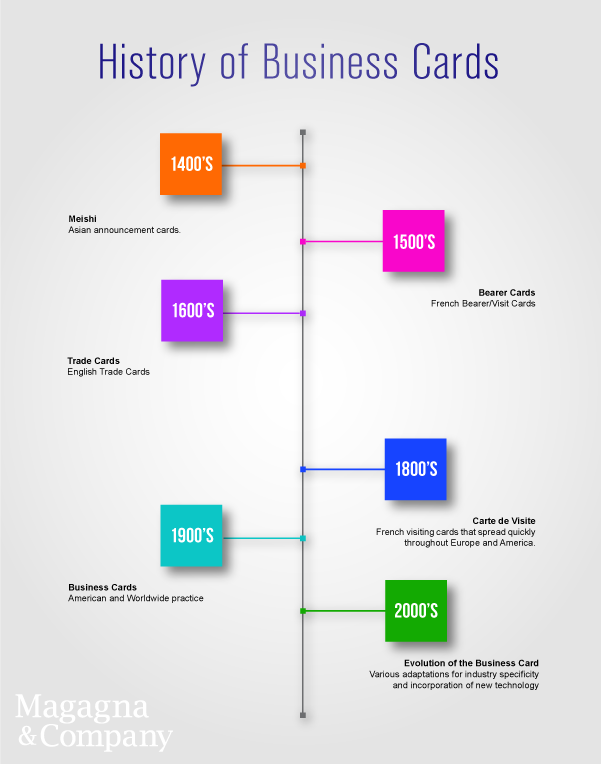 Home » Magagna’s Printing Company Blog » Graphic Design » Where Did Business Cards Originate? 10 billion business cards are handed out each year and most are thrown out within a week. Splash color cards are held on to 10x longer than their standard cohorts. For every 2,000 business cards distributed, a company’s sales will increase by 2.5%. Despite knowing many facts and figures, it’s rare anyone contemplates the emergence of such a ubiquitous practice. While popular references may make us believe standard practice began in the great socioeconomic boom of the 1980’s, the actual origin lands somewhere in the 15th century. To inform a local area of royal or elite visitors from out of town, the populace was given notice by Meishi. In the late 16th century Bearer Cards/Visiting Cards in France were used in etiquette for introductions. These “Visite Biletes” became a common courtesy as a respectful way to request an audience. The ornate nature of the card was thought to indicate status and guests were more welcomed with fancier cards. A little bit later, the Trade Card in London started coming into fashion. A hybrid between flyer and modern day business cards, these small Trade Cards involved pictures and locations to drive traffic to businesses. With acceptance and birth of practical photography, came the Carte de Visite. These were adaptations of visiting cards included photographs. Originating in France and quickly spreading to Europe and America, these cards became wildly popular. While calling cards continued in popularity for the early part of the century for etiquette, the concept of the corporate focused, well known business card evolved as well. Standard practices of cordial exchange and design became regimented in the 1980’s due to an accelerated rise in technology and advancement in globalization. Modern business cards have taken on a variety of different forms. Whether electronic (vCards, hCards, QR Codes), industry specific (Comp Cards for Models/Actors), green (recycled stock) or more creative, they have become a vital part to promotion and social climate of today. Here at Magagna & Company, we know all the ins and outs of stationery. Let us help you design and print the best impression for your brand! For more information on Business Cards look here, here, or here.